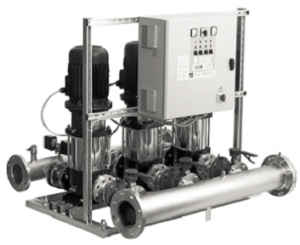 Ebara booster pump sets are available in three different operation modes. When water is demanded, it is drawn from the tank. This demand of water resulting the pressure drop in the system, when pressure drops to the set pressure, pressure switch trips and start the first Pump. If the pump’s flow rate is lower than demand, the circuit pressure will continue to drop until it trips the pressure switch, thus starting the second pump. When water consumption reduces, the system pressure rises, thus opening the pressure switches sequentially and shutting off the pumps one by one. When water is demanded, it is drawn from the tank. This demand of water resulting the pressure drop in the system, when pressure drops to the set pressure, first pump starts and the speed is controlled through inverter. If the pump’s flow rate is lower than demand, the circuit pressure will continue to drop and the system responds by increasing the pump’s speed. If first pump reaches its maximum speed and demand is still in excess of its delivery, second pump will start at maximum speed. 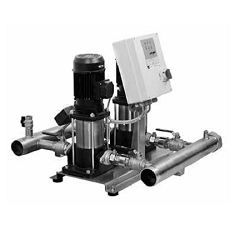 The speed of first pump is immediately adjusted so as to establish the operating pressure. If the system pressure even drops further, the first pump is once again running at maximum speed, the third pump will be started and so on for all pumps in the unit. If the water demand is reduced, the system pressure tends to increase resulting in the reduction of speed of first pump to maintain the operating system pressure. At this point, one of the pump which is running at maximum speed will be stopped, while speed of first pump will be adjusted to maintain the system pressure. As the pressure continues to increase due to reduced demand, once the minimum speed of first pump is reached then first pump will be stopped. The conveyed fluid must be: clean, potable, ground or mixed water, free of solid or fibrous suspensions and aggressive chemical substances. The units must be installed under cover, protected from the weather and freezing. Ambient operating temperature 0 – 40°C, no higher than 1000 m above sea level.